It is 35 years since taxi driver George Murdoch was found dead beside his taxi, with a cheese wire garrotte lying nearby. But his family are still determined to find his killer. At 20:35 BST on Thursday 29 September 1983, the 58-year-old cabbie picked up a fare in Aberdeen's west end and told his control room he was heading to Culter. He never made his destination after a brutal attack en route. About two miles into the journey, it appears Mr Murdoch turned off onto Pitfodels Station Road, just on the outskirts of the city, where he was assaulted and later died. Two cyclists saw Mr Murdoch being attacked and phoned the police but when officers arrived it was too late. No-one has ever been caught over his murder. The family of Mr Murdoch, who they called Dod, has offered a reward of up to £10,000 for information which leads to an arrest. His nephew Alex Mckay, who is now 61, said Mr Murdoch and his wife Jessie did not have children so they gave a lot of love and attention to their nieces and nephews. "Dod was always smiling," he said. "He was a kind, gentle man. The nicest of guys." Mr Murdoch had only been a taxi driver for a few years, taking up the job after being made redundant. His wife, who died in 2004, worried about his safety but he told her he would never resist a robber. His money and wallet were stolen in the attack but police said they could not say if this had been the motive. 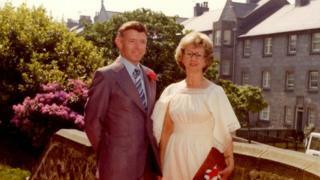 Mr Mckay told BBC Scotland: "My aunt Jessie never got over his murder. Her health over the years deteriorated. "She never really spoke about it. I think she didn't want us to feel her pain but we did, we really felt it." Image caption His nephew Alex Mckay said Mr Murdoch was "the nicest of guys"
Mr McKay said that somebody must know who killed his uncle. "Whoever it was must have had a mother, he may have a sister, a girlfriend, a wife, people that notice things," Mr Mckay said. "He must have betrayed some signs that got them thinking 'something's not right here'. "It's my belief that somebody knows what he did." Mr Mckay appealed for them not to take that information to the grave. Before he was killed, Mr Murdoch had picked up a fare on Queen's Road near the New Marcliffe Hotel. Det Insp Gary Winter, from Police Scotland's Major Investigation Team, said the taxi was not booked so there was no record of who the customer was. It was a late night shopping evening in Aberdeen and the city was busy. Mr Murdoch set off for the six-mile journey to Culter but a few minutes later he was fighting for his life in the suburb of Pitfodels. Det Insp Winter said two young cyclists saw his taxi parked with the lights on. "As they pass the car, on their left hand-side, they see George being assaulted on the pavement by the perpetrator," the police officer said. "They cycle about mile down the road to the Cults hotel and phone the police from a telephone kiosk." A huge murder investigation was launched in 1983, with 10,000 homes visited and 8,000 statements made. Det Insp Winter said: "In 25 years in the police service I have never known anything like that. "A massive inquiry was launched at the time but unfortunately it did not identify George's killer." He said his team were reviewing the case, using the most advanced forensic techniques available. They are also re-interviewing key witnesses who saw the assault take place. The murderer has been described as a man is his late twenties to early thirties, who had dark hair which sat over his ears. He was of a thin build and about 5ft 7in. Police said the killer would now be approaching his sixties or older. Det Insp Winter said a cheese wire was used during the assault "which is clearly an unusual item to have in your possession". "I believe that someone must have suspicions about who did this given the route taken that night by the killer, the violent nature of the assault and the cheese wire they had with them."